These are the newest things from Red Red Krovvy since their hefty 7” on R.I.P. Society a while back. The usual sources tell that these will feature on a forthcoming 7” release on Helta Skelta Records so that is something to look forward to. 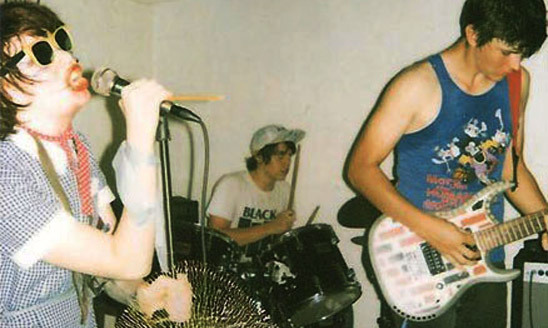 ‘Sick’ is a roughhouse track of power-punk and bratty brashness. It’s fast and loud and does away with any unnecessary flourishes. It’ over in 2 minutes and that’s great because any longer and the song would lose its power. Lyrics are sparse; there isn’t much to say when you are sick I suppose. ‘Real Life’ is even shorter but crams a few more words in; more yelling, more beat. Red Red Krovvy is one of those bands that will pop up every now and then and drop something meaty before going dormant again. The trio consists of Nick Warnock (Ruined Fortune, Bed Wettin’ Bad Boys, R.I.P. Society), Ash Wyatt (Little Desert) and Adam Ritchie (Drunk Mums). Formed around some old connections from back up Cairns way, RRK is, for lack of a better term, a side project. These are capable musicians who do punk right and well – they can pop up whenever and drop songs like this on us and you can consider us all happy. Good to hear them again. Get up and flail around to these and then sit down again.